In a string of big releases from Image Comics over the past year, BLACK SCIENCE was one of the biggest. The atmospheric pulp sci-fi adventure by Rick Remender (DEADLY CLASS, Captain America) and Matteo Scalera (DEAD BODY ROAD, Secret Avengers) debuted in November and has had multiple printings of every issue released, garnering praise from critics and professionals alike. 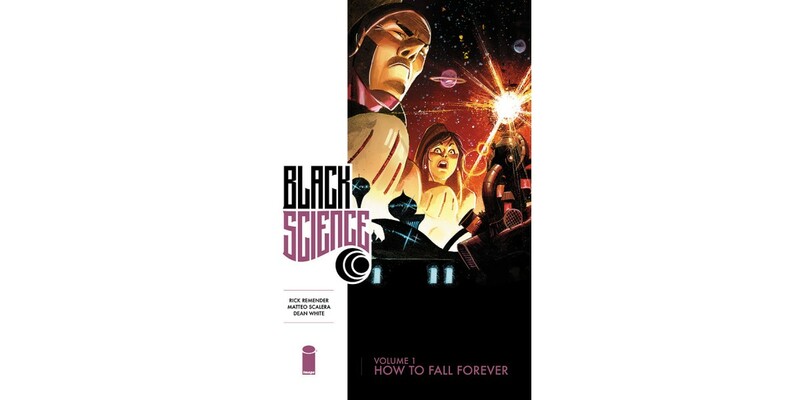 The first six issues are now being collected into BLACK SCIENCE VOLUME ONE: HOW TO FALL FOREVER, arriving in comic book stores on May 28 and bookstores on June 10. Anarchist scientist Grant McKay has defied conventions and done the impossible, using a device called the Pillar to punch a hole between dimensions that allows him to travel through all possible universes. But now Grant and his team are storm-tossed on an infinite ocean of alien worlds and long-forgotten, ancient, and unimaginable dark realms. With no clear route home, the only way is forward, through the madness of the lightning sea-swamp and a futurepast trenchworld, where the Sons of the Wakan Tech-Tanka wage never-ending war on the savages of Europe! With an intense, mind-warping story in the vein of H.P. Lovecraft, action-adventure thrills à la Edgar Rice Burroughs, and fantastic Frank Frazetta-inspired visuals by the art team of Scalera and colorist Dean White, BLACK SCIENCE VOLUME ONE is a must-have for any lover of classic science fiction and fantasy.